Saag Paneer, Pakoras, and the Queen of Fragrance. Indian flare nights are always exciting at the homestead. Rich spices & flavors, fresh vegetables, and wholesome grains. I also love meals where there are plenty of condiments to choose from. 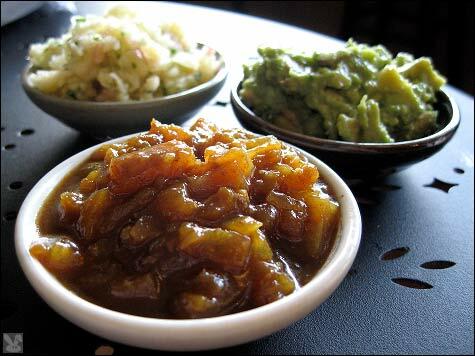 Chutneys are a delicious accompaniment to Indian dishes. Traditionally they contain fruit, vinegar, sugar, and spices, and can range from mild to hot, chunky or smooth. So tonight we made a HUGE meal, with the hopes of leftovers carrying us through the following day. If you live in San Diego, I have recently been introduced to our “Little India.” And might I add, I can’t believe its taken me this long to get there! Over in Clairemont, by Black Mountain road, you can find all sorts of cheap, Indian grocery stores, restaurants, and other fun things such as fashion outlets for saroongs! I was blown away with the minimal prices, as well as the authentic selection of food. 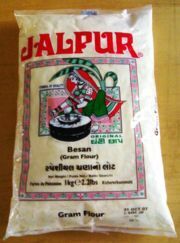 For a couple staple items, I grabbed a big sack of basmati rice, a bag of imported chick pea flour, incense, bulk turmeric, cold lychee drinks, and some culinary tips from the store-run family! Saag Paneer tends to be a favorite amongst us veg-heads. I believe its a result of all the minerals we intake when we eat large doses of spinach. But whats a girl to do when most of her favorite Indian restaurants are consumed with using ghee, and paneer? 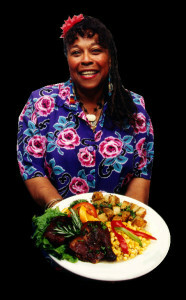 Get to work in the kitchen thats what! For those of you who are unfamiliar with Paneer, it is a homemade cheese, made by curdled milk and lemon or lime juice. 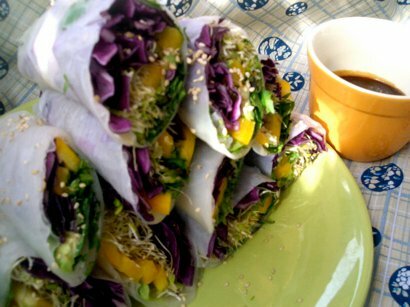 It is quite similar to tofu, so its easy to substitute. Ghee is actually a very healthy way of eating butter, but of course, I ALWAYS use my favorite, earth balance butter. I couldn’t give away my favorite saag recipe, but here is my pakora recipe. This is awesome for those of you trying to stay away from wheat and gluten. It is also *super* fun and simple to make! If you have a mortar and pestle, I suggest using that to grind your seeds and mix your other spices. If not, a coffee grinder will grind them just fine! Assorted Veggies, broccoli & cauliflower florets are a hit! If your going to be using thicker vegetables, such as yams, or carrots, try steaming them first to soften up. ***Start by mixing the flour and water in a bowl to make a stiff dough, then adding a little more while beating with wire whisk, to make a thick batter. Let sit for 30 min. Meanwhile, grind and mix your seeds & spices. After 30 minutes, mix spices in, batter should still be thick. If you have one of those cute little home use deep fryers, they will turn out perfect, but those of us who don’t…..
Submerge a vegetable floret into the batter, then quickly & gently drop into heated oil. If entire floret is not covered, batter may slightly fall, so just be quick on turning them. When all sides are slightly browned, remove and drain on paper towel. Serve at once, accompanied by a sweet mango chutney. 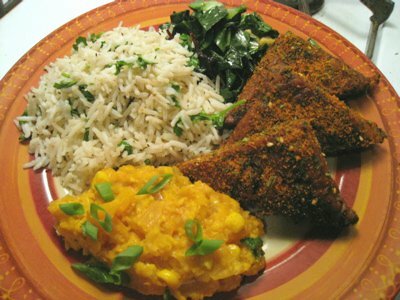 This entry was posted in Gluten Free and tagged basmati, india, saag paneer, vegan, vegpod. 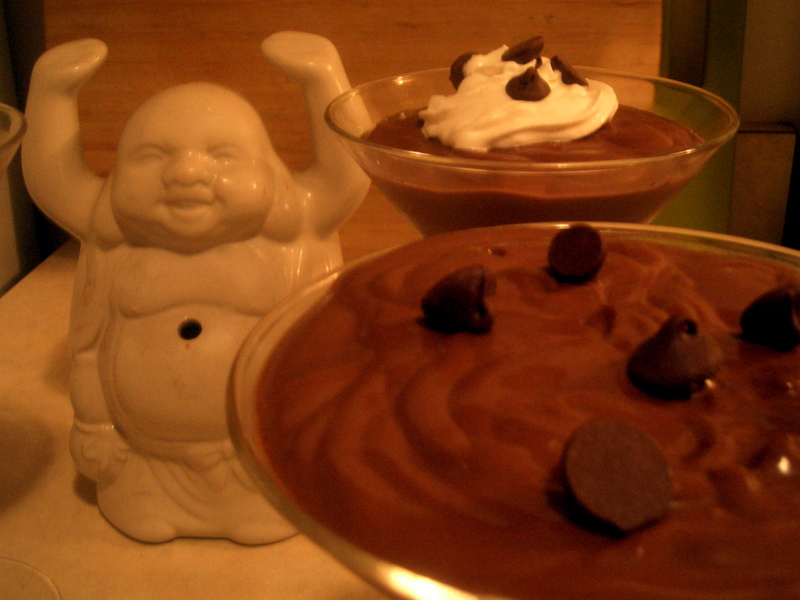 Yes, even Buddha would appreciate a healthy chocolate pudding every now and again. As I’ve said before, chocolate is my favorite feel-good super food! If you’ve read the key lime pie post, I mentioned being fascinated with my new hip grocery item, carbonated soy-whip cream! So this is what else I did with it. Simple, yet elegant, Rich Chocolate Pudding. Made with only a few ingredients, this dessert can be made in a jiffy. Its also a bonus that most of the ingredients are a probable staple in most veggie pioneer kitchens! This recipe is really about getting the basics, and using your own taste buds. Start with 1 pound of silken tofu, drain and set on paper towel for 15 min. Crumble tofu, and place in food processor. Add melted chocolate, 1 Tab. of coconut oil, and 1/2 a scraped vanilla bean. Blend till smooth. Test for sweetness, and richness. If you feel you need a little more sweetener, add in some blue agave syrup. For a boost, you could add a teaspoon of extract such as mint, almond, or orange. This makes about 4-5 servings. Get funky and add some whip cream, chocolate chips, sprinkled cinnamon, shaved coconut, etc. Have fun! I’ve recently read an article on chocolate fueling our cars…. Well sort of. But how??? Scientists extract hydrogen through gases in waste food. They then began converting formic acid to hydrogen like mad. The discovery of a way to extract hydrogen from food waste could be a real breakthrough for both industry and the environment, because the process isn’t restricted to chocolate waste. It works equally well on many other types of food waste. The ability to convert food waste into clean renewable energy instead of garbage has the potential to transform the food industry. 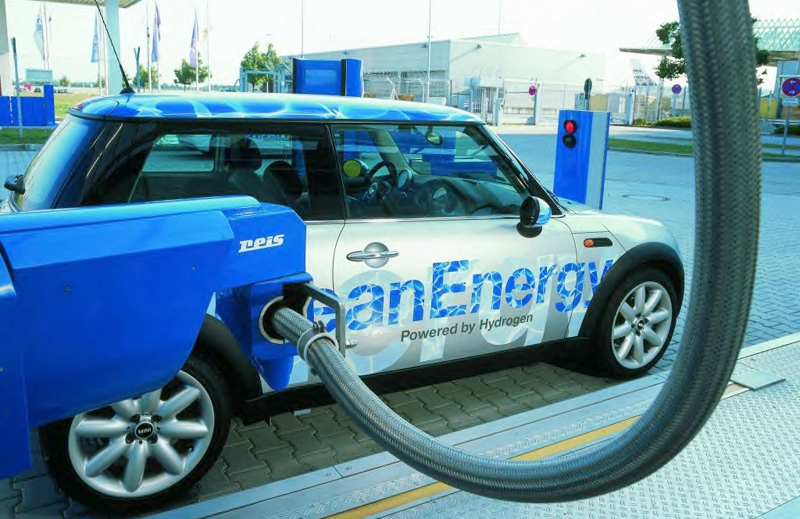 Using this process, food factories could conceivably use their own waste products to power their manufacturing operations, or to fuel a fleet of hydrogen-powered vehicles. Wouldn’t that be nice? I still have no sympathy for the Hummer drivers of the world, but this guy gets a star……. 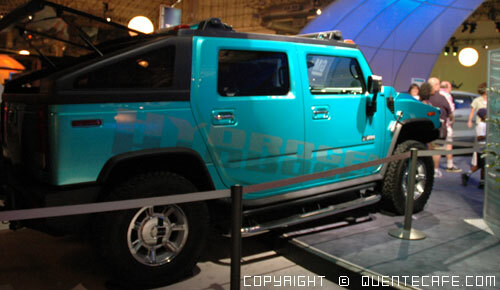 The first H20 powered Hummer! This entry was posted in Desserts, Gluten Free and tagged buddha, chocolate, pudding, vegan, vegpod. 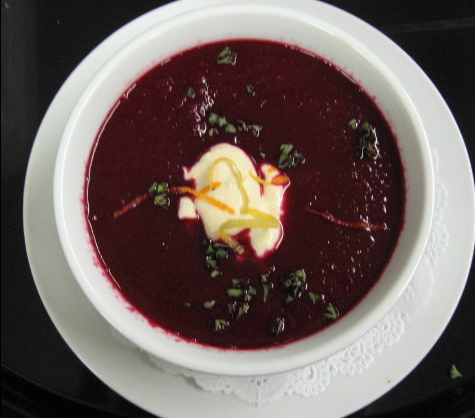 As we all know, Borscht comes to us from Russia and Poland. Beets are high in potassium, and those green leafy tops contain more iron than spinach itself. Beets are especially great in the summer! The acidity & sweetness of the OJ in this recipe helps to make this soup a tad sweet, and super creamy. 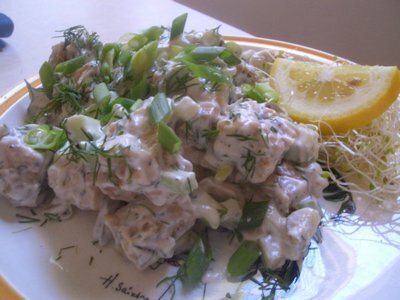 As for the sour cream, the fresh herbs help to cut the bland taste of the tofu. *In large pot, combine water, beets, tomato, carrots, and bell pepper, and bay leaf. Bring to boil, and allow to simmer for 30 min. Meanwhile, Heat 1 Tab. of olive oil in saute pan over medium heat. Add in onion, scallions, and garlic. Saute till onions are translucent. Gently stir in parsley once heat is turned off. Remove bay leaf from broth mixture. Then combine sauteed vegetables with broth mixture. If using a food processor, you may need to puree in batches, but if you have a small hand held blender, use it! I haven’t tried to puree this in my blender, but if you’ve got a vitamix, it should work! After you’ve pureed the mixture, stir in the OJ, sea salt, and pepper. ***In a small stainless steel bowl, dissolve agar in fresh lemon & lime juice. Blanch tofu for 5 minutes, drain and cool for 20 minutes. Blend all ingredients and till smooth. If mixture is still warm, transfer to bowl and let sit in refrigerator till chilled. Dollop Sour cream to top the Borscht, along with some orange zest and minced chives. This entry was posted in Gluten Free, Summer and tagged beets, Borcht, Russia, vegan, vegpod.